Details relating to the Luxembourg Commemorative of 2015. Mint Mark : Mercury’s Wand. 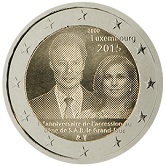 This coin was issued to commemorate the 15th anniversary of the accession to the throne of Grand Duke Henri. In the inner circle is Grand Duke Henri together with the Grand Duchess Maria. This is the second time, first used in 2012, where the figures are represented by a number of points. It supposedly gives a realistic impression of the persons depicted. Looking at the image of the coin, one has to agree. The year of accession, the issuing country and the year of issue are shown around one o'clock and finally at the bottom (six o'clock) is the mint mark. A slightly unusual feature is the intrusion into the outer ring of parts of the inscription and the country name. The outer ring is supposed to only contain the twelve stars of the EU. Luxembourg’s commemorative are not very exciting as they normally simply show the head of a grand duke or duchess, reigning, living or dead! From Luxembourg Commemorative 2015 to euro coin collector.